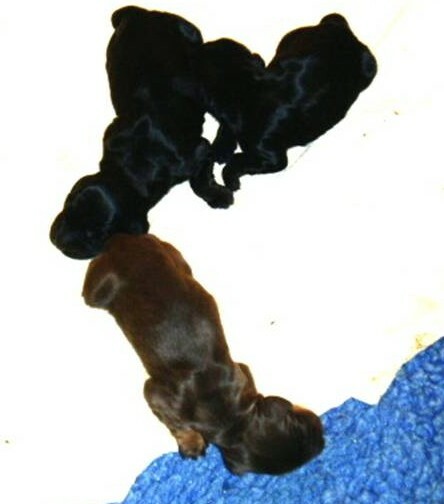 My field spaniel Georgia had her first litter yesterday morning - 2 boys and 1 girl. The two boys are black, the girl is liver and tan. I was going to try really hard not to keep one, but I think I'm going to keep one of the boys (and Georgia's co-owner and breeder will be keeping the other two). This picture was taken when they were about 12 hours old. I haven't seen them in person yet - if Georgia sees me, she may think her work is done and it's time to go home, and she does still need to take care of them for a little bit longer! I am getting worried - when is this going to stop? I just got an email from my son - autogenerated from his birthday wishlist from amazon. So he's made an automated gift registry for his birthday and emailed it to me (from his gmail account, of course). We have a 24 year old scarlet macaw - my husband got it a long time ago, long before he knew me. You can't tell a boy scarlet from a girl scarlet without a dna test, and it didn't really matter to us, so we just always referred to the bird as a "him" - his name is Erasmus, and Erasmus was a guy, so it was as good a guess as any. In the middle of the night (it felt that way, but was probably in that nether space between when/if teenagers go to sleep and when we do), one of our sons burst into our room saying, "Raz laid an egg!" And he, um, she, did. The now known to be feminine Raz has been sitting on an egg all morning, turning it, and being rather protective of it (scarlet macaws can be dangerous!) She's going to be disappointed as she is our only macaw, so nothing will hatch from that egg. And we don't really need to add to our menagerie, so fixing that problem is not on the agenda. And wonder why after 24 years, this bird would decide to start laying eggs.